Rachmaninov in the Rockies: Pianist Daniil Trifonov dreams of playing the composer's Fourth Piano Concerto on a train. But with imagination, and a little cash, it's possible to shoot something more pleasing and exotic — like, for example, a Western by way of Rachmaninov. That's what folks at the Deutsche Grammophon label have done to promote their new release, Destination Rachmaninov – Departure, by pianist Daniil Trifonov. The much-in-demand young Russian, dressed in late-19th-century garb, steals aboard a deserted vintage locomotive and dreams of playing the opening movement of Rachmaninov's Fourth Piano Concerto. Director Michael Joseph McQuilken cuts back and forth between his stowaway and Trifonov the star pianist, who performs the music with his singular combination of swagger and stunning technique. 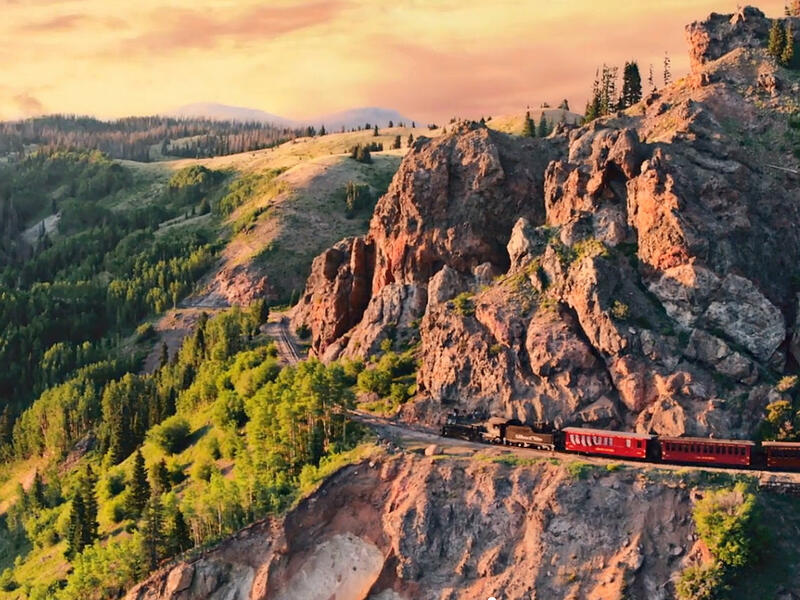 Rachmaninov's concerto, with its grandeur and sweeping melodies, makes a surprisingly fitting soundtrack to shots of Trifonov's train as it winds its way through the verdant southwestern Colorado Rockies. As it turns out, some of the score was composed on American soil when the composer was living in New York in 1926. McQuilken's sets are effective, while the hulking locomotive ought to be familiar to anyone who's ridden the restored narrow-gauge steam engines of the Cumbres & Toltec Scenic Railroad, based in Chama, N.M. The line was once owned by the mighty Rio Grande Railroad, active in the 1880s. Though no trained actor, Trifonov exhibits unaffected charm as the poor stowaway; perhaps the most satisfying moment arrives as he unfurls a weathered paper keyboard on which he fingers Rachmaninov's lush melodies. In his dream, he finds a real piano on board, but the end provides a rude awakening when a stern conductor tosses him off at the next station as Rachmaninov's music breaks off in an abrupt halt.